To make the shortbread, place all ingredients in the bowl of a food processor. Process just until the mixture comes together into a ball of dough. Wrap and chill for 30 minutes. Preheat oven to 180°C. Roll out dough to 3mm thick. Use a 5cm cookie cutter to cut out approx. 70 rounds. Place rounds on greased baking trays. Bake for 10 minutes or until golden brown. Remove to cool. To make marshmallow, place water and sugar in a pot and bring to the boil. Stir until sugar dissolves then boil rapidly for 2-3 minutes to make a syrup. Squeeze excess water from softened gelatine then add gelatine to the pot. Transfer mixture to the bowl of a stand mixer. Add vanilla and beat for around 10 minutes or until the mixture has cooled and is very thick and fluffy. Place mixture in a piping bag. Pipe peaked puffs of marshmallow on top of each cookie. 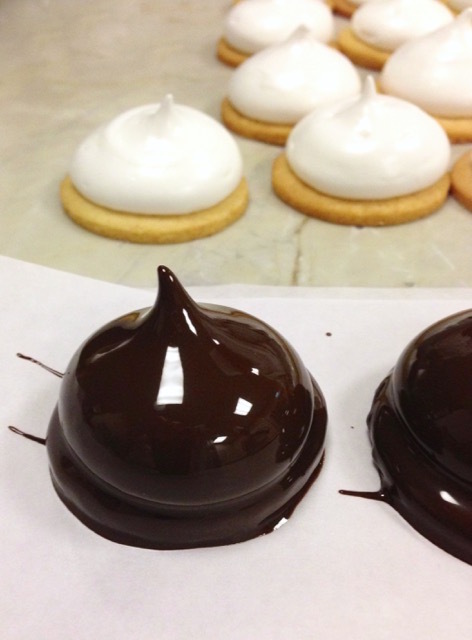 To chocolate coat, dip marshmallow end first into melted chocolate, flip over and remove with a fork. Shake off excess chocolate and place on baking paper. Leave at room temperature for at least 30 minutes for chocolate to set. This entry was posted on September 14, 2017 by julie.